It goes without saying (for me) that I'm joining in Me-Made-May next month, but I've been mulling over I can do for my challenge. And, to tell the truth, I'm not really upping the ante since the last challenge, despite Zoe's rousing encouragement! I only started sewing maybe a year and a half ago, so my earliest creations don't quite make the mark anymore. So I still don't have enough me-made to do entire outfits every day for a month. BUT, I will for sure wear something every day and try to whole outfits when I can. I think that, like Roobeedoo, I want to try to step it up another level as far as really trying to put together some nice outfits. I am generally not someone who dresses up, but I would like to work on refining my style and this is the best opportunity. Since I started sewing I've had to spend more time thinking about how I dress and how various styles look on my body than I have in my entire life previously! So, I am officially joining Me-Made-May and will endeavor to wear one me-made article every day for the duration, and I will try to wear entire me-made outfits as often as possible. In other news, the Colette Spring Palette Challenge 2012 has begun. I already made myself a spring palette and I won't be changing it, but I will be joining in the challenge. I have yet to start working on anything though because I'm still finishing up my Fall/Winter list. Since I'm still wearing a sweater as I type this, I don't feel that behind, but in any case, I'm nearly finished! 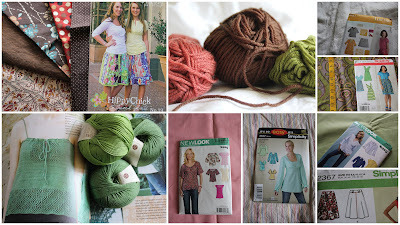 I have only one shirt left to do and I plan on starting it this weekend. As far as challenges go, the Fall/Winter one has been the most successful for me in that I've completed (nearly) everything I set out to do, and as originally planned. I think this is because I thought it through better and I stuck with fabrics and patterns already in my stash. My first Colette Spring Palette Challenge was a disaster from the point of view of completion, so hopefully this one will be better. Speaking of Colette patterns, the new spring/summer line-up was released on the 10th, and it's brought home to me even more than my style isn't really centered in the 50's, which is where I think Colette gets its primary inspiration. I love the patterns and I love looking at what people sew up, but a lot of the styles just don't call to me personally. I want to look at them, but not to wear them. For example, I like the new Lily dress, but for the life of me, I don't know where I'd wear it. And I'd probably feel out of place in it. In any case, I need to get cracking on the Colette patterns that I have already and I've never made up: the Beignet, the Crepe wrap dress, the Chantilly, and the Negroni. I feel like those patterns do fit into my style zone, and yet, I keep passing them over. I will be taking a crack at Negroni the end of this month though, I owe my husband! Hooray! I'm excited to see all of your outfits and palette creations! Good plan for Me-Made-May. I was also thinking that I'd like to put some good outfits together, rather than just wear something for the sake of it being me-made. I'm still debating whether to do the palette challenge myself. I have enough black & white projects that I can easily just focus on those, but I also have a couple of colored projects I'd like to do before it gets too warm around here and I'm not sure they'd go together for a cohesive palette. It's the Beignet skirt and a Simplicity Project Runway top, so I certainly wouldn't be wearing them together! I look forward to seeing you over in Me-Made May, and seeing your outfits! It's morally wrong to cut and paste someone elses mood board, right and make it your own right? I mean, you'd notice, right? Even if the other persons mood board was Mary Poppins perfect and you wanted everything they had planned. Ok, fine. I'll make my own, but yours is so perfect! I love it. I'm so glad you're joining MMM, it's gonna be so much fun! Ah, that green yarn is such a pretty colour! :) And the lace pattern is lovely, too!